CANADA - Eric Curran, of East Hampton, Mass., captured his fourth SCCA Pro Racing SPEED World Challenge GT Championship win of 2007 at Mosport International Raceway, part of the Mobil 1 Presents the Grand Prix of Mosport weekend. Lawson Aschenbach, of W. Palm Beach, Fla., and Michael Galati, of Olmsted, Ohio, completed the top three. After heavy rain soaked the track, the field made its standing start under clearing skies. Potential disaster was averted as neither polesitter Aschenbach's No. 1 XM/Mobil 1/Motorola/Bose Cadillac CTS-V nor second-starting Randy Pobst's No. 22 K-PAX Racing/Jim Haughey Porsche 911 GT3 moved as the lights went out. Aschenbach quickly re-fired the Cadillac, but Pobst sat stationary and was grazed by fourth-starting Ron Fellows� No. 16 XM/Mobil 1/Motorola/Bose Cadillac CTS-V, forcing both to the pits for repairs. Galati started third in his No. 23 K-PAX Racing/Jim Haughey Porsche 911 GT3 and safely made it past Aschenbach to take the lead. Curran, who started sixth in the No. 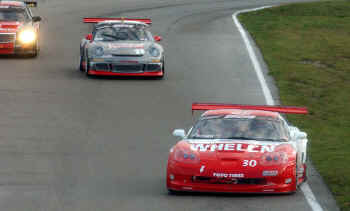 30 Whelen Engineering Chevrolet Corvette, was quickly to third, pressuring the two leaders as they broke away from the field. Curran was by Aschenbach�s No. 1 XM/Mobil 1/Motorola/Bose Cadillac CTS-V on lap seven, and made the B&M Oil Coolers Coolest Move of the Race a lap later as he passed Galati for the lead in Turn Three. From there, Curran battled high engine temperatures and a drying track that took its toll on everyone�s Toyo Proxes RA-1 rain tires en route to a 6.165-second win, averaging 97.555 mph in a race that went green the whole way. �I pushed real hard in the beginning,� Curran said. �We went with a half wet, half dry set up. We basically left the car as stiff as we would run it in the dry and put the wet tires on. I didn�t know what to expect, but as things were changing temperature wise, we figured that it was going to dry up and we better have something as close to dry as we could. I think it was a pretty good choice, because the car was great. The Whelen Engineering and Marsh Racing guys have been working so hard at this. It�s very exciting to have a fourth win in a single season. After starting on his first-career pole, Aschenbach drove to his fourth second-place finish of the season, but closed in on what could become his second-straight Drivers� Championship. He is now just six points behind leader Pobst. Aschenbach�s team went with a full wet setup, while Curran elected for a dry setup with full-tread wet tires. �I was full wet,� Aschenbach said of his setup. �There was no discussion. We were going to go wet no matter what. We were contemplating, if it went dry fast, coming in within the first ten laps, putting on drys and going back out. It wasn�t worth it though once we got going, but by the end my tires were shot. There�s was no tread left on them. I was sliding all over the place. �I pretty much screwed up the start, it�s as simple as that. I stalled the car, but got it re-fired pretty quickly. Luckily, Pobst stalled his car too. Otherwise, I would have had to get around a lot more people. I was really aggressive the first lap and got back up to second. Once it started drying out and I saw Eric coming, I knew we had nothing for him. Then I fought with Michael a little bit and we had a good battle going. I tried to run down Eric, but like I said, we had nothing for him. Galati, who won the 2006 SCCA SPEED GT in heavy rain by nearly a lap, came home third for his second podium finish in the last three races. �Last year I won in the rain and this year I won in the rain; I was leading until it started to dry out,� Galati said. �Once the track started drying out, I was a sitting duck. We had rain tires on and once they started getting hot I started sliding all over the place. Eric got by me quite easily, then Lawson and I fought quite a bit and he got by me when we got caught in traffic. Then my car went to hell and I was hanging on by my teeth. In the end, the conditions weren�t tricky, it was just wet tires on a dry track. Andy Pilgrim (No. 8 XM/Mobil 1/Motorola/Bose Cadillac CTS-V) emerged on top of a race-long battle with Brian Kubinski�s No. 12 Diamond Construction/Blackdog Racing Chevrolet Corvette to take home fourth. Kubinski was the Piloti Rookie of the Race, finishing fifth. Possibly the most intriguing drive came from Lou Gigliotti, who started 13th in his No. 28 LG Pro Long Tube Headers Chevrolet Corvette on dry tires. Gigliotti fell back to 16th at the start. At the race�s mid-point, however, the dry tires emerged as the fast setup and he began to click off fast lap after fast lap, often two or three seconds faster than the leaders. The caution he needed never came though, and his run toward the front ended in sixth place. Gigliotti�s teammate Doug Peterson (Chevrolet Corvette), Tony Gaples (Chevrolet Corvette), Jeff Courtney (Dodge Viper) and Michael McCann (Dodge Viper) completed the top 10. McCann, of N. Canton, Ohio, started from the pit lane after changing tires on the formation lap and earned the Sunoco Hard Charger for advancing 11 positions from his 21st starting position in the No. 82 McCann Plastics/K&N Filters Dodge Viper. Lenny Diller, of Garden City, N.Y., earned the Toyo Tires Cup in his No. 51 King Cole Audio Visual Dodge Viper, finishing 14th. Despite his 17th place finish, Pobst held on to the point lead by a slim four points over Pilgrim, 228 to 224. Aschenbach is third, with 222, followed by Galati (207) and a resurgent Curran, with 190. Curran is the only driver with more than two wins on the season, but he also had three-straight DNFs at Miller Motorsports Park, Lowe�s Motor Speedway and Watkins Glen International. Cadillac maintained its SCCA SPEED GT Manufacturers� Championship Presented by RACER Magazine lead by three over Chevrolet, 53 to 50. Porsche is third, with 46, followed by Dodge, with 19. Today�s race will be broadcast on SPEED Channel Saturday, Sept. 1 at 2 p.m. (EDT). The series next travels to Road Atlanta as part of the Petit Le Mans, Oct. 3-6.